An aerial view of the Ness of Brodgar excavation site from Hugo’s kite. Structure One is pictured in the top left; Structure Fourteen in the top right and Structure Eight at the bottom. It’s not often that we open with a pottery discovery. Most archaeologists profess to dislike pottery (see Mai, below) and at the Ness it comes by the truckload, thus diminishing its rarity value. Those of us who do like pottery tend to be shy and retiring and certainly not willing to talk about it openly, for fear of assault. However, today brought a fascinating, and fragile, piece of pot from the passageway at the end of Structure Ten. 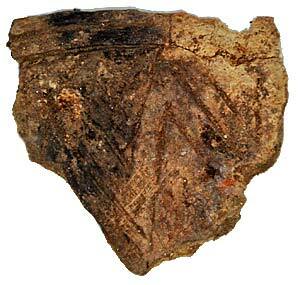 The sherd of finely incised Grooved Ware pottery from Structure Ten. It is a delicately incised Grooved Ware rim, with incisions in the form of lozenges, and it lay just under a bone deposit which has already been dated to 2300BC. It is reasonable to suppose, therefore, that the deposition date of the pottery is also around that date. Amazingly, this fits in perfectly with a similar Grooved Ware sherd found in a quarry context at Antonia and Dan’s excavation on the island of Wyre, which also dated to 2300BC. At this point, and only if you are all feeling strong enough, we must dive even deeper into the strange world of ceramics. The received wisdom for the dating of Grooved Ware pottery suggests that where you have a well-stratified site with both incised and applied (the other sort) Grooved Ware, the incised material tends to be earlier. The latest date for the Ness thus far is 2300BC, and the bulk of the pottery is applied Grooved Ware, therefore it is the applied stuff which should be lurking around the 2300BC date and the incised should be earlier. You may now be realising why so many people dislike pottery studies, but we must plough on. The exception to the above is the nearby site of Barnhouse, where both incised and applied Grooved Ware was found together in the same contexts. Is the received wisdom wrong, or do the Ness, Barnhouse and Wyre represent a curious anomaly? The best that can be said at the moment is that a firmly open mind is the only sane strategy to pursue. Georgie, Woody and Colin discovering new art as they dismantle Structure Seven. More discoveries and more dates are needed urgently, and the Ness is likely to provide both this year. In the new Trench T, mattocking and trowelling is continuing and rubble spreads are beginning to appear which now confirm the predictions of geophysics. The hope is that these will indicate that there is walling further down. There has been a lack of finds from the trench, apart from a little burnt bone, some pot and flint, but this is not surprising so high up in the trench and more is sure to appear soon. 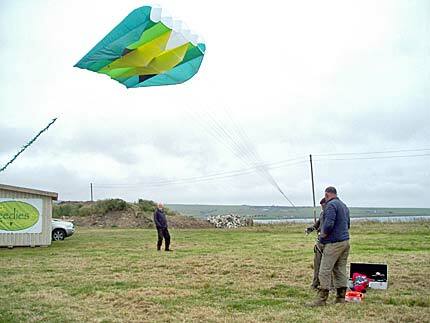 Hugo’s magnificent kite flying is also mentioned by Mai (below) but apart from the fun, the intent is deadly serious. Last year Hugo’s aerial work produced some magnificent aerial photographs of Structure Fourteen, stitched together from well over 200 shots. Nick is particularly interested in the possible uses of aerial rectified images of this sort, particularly as some of them may even be used eventually to replace the expensive and time-consuming business of manual planning. This is a difficult area, for a talented planner can bring a plan alive and accentuate important details. But such people are few and far between, even if many in the rest of the profession may need further persuasion on the advantages of rectified photography in those contexts. In Structure Ten, Jan is half-sectioning, recording and gradually removing the south dresser and Mike continues to clear the robber trench in the south-west corner. Nearby, Claire is removing the remnants of the west dresser which Sarah started to dismantle last year. The interior of this phase of the structure is now looking a little more spacious. In the central midden, Jane is clearing the wall lines of the south end of Structure Eight, and encountering the re-use and re-alignment of stones from the earlier structures underneath. This is difficult and complex work but it will eventually confirm the south wall of the structure as well as throwing further light on what lies beneath. In Structures One and Fourteen, the discussions on the exact strategy to be followed for floor sampling continue, but agreement is near. We started with a pottery discovery and we finish today with a pottery departure. Dr Ann MacSween, the eminent pottery specialist from Edinburgh, has been digging with us for the past week, with her daughter, Emily. They dug here last year and clearly the Ness bug has bitten. Ann is a good friend and colleague of many on the site, indeed Nick shared an office in Bradford with her years ago. Safe home, and we hope they will both be back next year. Jan, Mike and Claire, hard at work in Structure Ten. 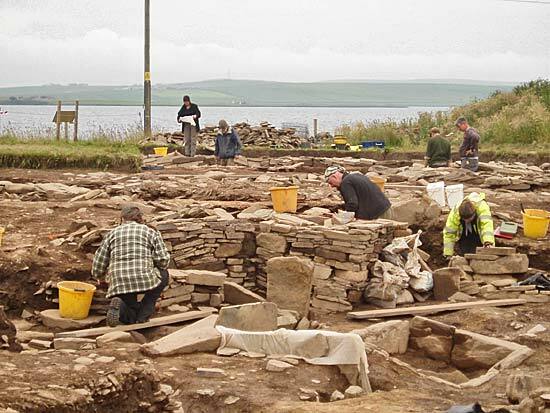 Hello and welcome to the wonderful site of the Ness of Brodgar! This is Mai Walker here, from the University of Manchester, bringing you the tales of the day. It is Friday and spirits are high while we get into the beginnings of excavating. Many exciting finds have began to emerge; foreign stone, pottery, flint and stone tools and even large pieces of bone! While excavating Structure Twelve, some fantastic roof tiles have started to appear, as well as an amazingly preserved jawbone that appears to have been placed onto the stones! Meanwhile, the boys have their toys out as Hugo propels his camera kite over the site to get some fantastic overview photographs. This sight is fantastic to see as it proves to be a successful and unique technique to obtain aerial photographs, as well as being humorous to see how excited a fully grown professional can be while flying a kite. The week has been a very laborious experience, yet is necessary for the site. Removing plastic sheeting and sandbags reveals the archaeology to allow us to progress. 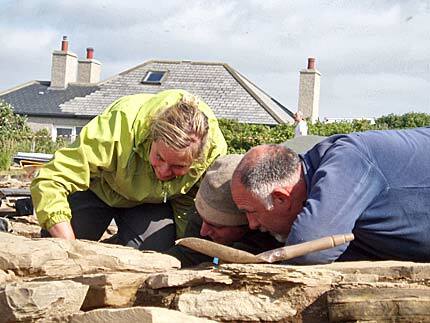 However, this process and sharing in hard work ultimately establishes important bonds between the archaeologists. This will be my fifth year excavating at the Ness of Brodgar and I have found that one of the best things of the site, apart from the incredible archaeology (of course), is the fantastic social bonds created with the other archaeologists and volunteers. These ties show how the Ness of Brodgar has created a family through excavation. It is interesting to compare how the archaeology suggests that Neolithic people, 5,000 years ago, returned to the site to carry out activities and create social ties, when very much the same process can be seen within our own annual return to the site as archaeologists, and creating our own social ties. Almost within a continuing of experiences throughout time. The site itself proves to be on archaeologists top digs of all time! It is the ultimate “trump card” one might say. 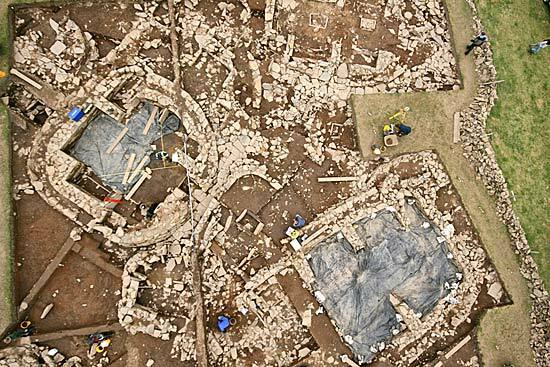 If you have not visited the Ness of Brodgar before, I sincerely suggest you do — for the knowledge and experience you will gain from seeing the site first hand, as well as the very informative and free tour!